Wine in PET bottles: will plastic replace glass? Alternative packaging for wine is nothing new. Indeed, glass bottles themselves are a relatively recent innovation in the history of wine, dating back to the 18th century. Prior to this wine was transported in bulk, and sold from barrel or clay amphora, moving to more temporary storage media at destination, such as the wineskin. It’s worth bearing in mind that much today’s wine still never sees a bottle, but is drunk close to source. The introduction of glass as a storage medium changed wine as we know it: while the notion of ageing wine is not a new one (old Falernian of Rome springs to mind), bottles sealed with corks made it possible for the current fine wine scene to develop. In recent years, moves have been made to replace glass, which while being excellent at protecting wine from the ingress of oxygen, is heavy and has a tendency to break. There has been a shift to bag-in-box for cheaper wines, as well as more radical options such as Tetrapak and cans. But the latest development—and one making headlines in the UK at the moment—is the appearance of 75 cl (standard sized) PET bottles on supermarket shelves. 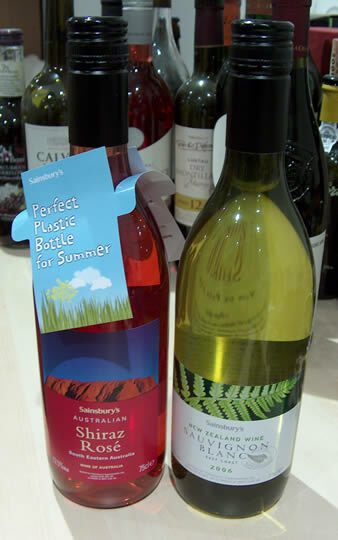 Two wines, a New Zealand Sauvignon Blanc and an Australian Shiraz Rosé (pictured above) have been launched by UK supermarket Sainsbury’s in PET. Later this year Aussie producer Wolf Blass will be launching two of its Green Label wines in PET. Why is this so newsworthy? Well, there are two main reasons. PET, a plastic which has the more formal name of polyethylene teraphthalate, has been used for wine before, most commonly with small 25 cl bottles, and also with 1.5 litre bottles of plonk from the south of France. But this is the first time that wine in standard sized 75 cl bottles has been presented in plastic on supermarket shelves. So what are the advantages and disadvantages of PET wine bottles? Weight. A 75 cl glass bottle weighs around 400 g; the same size in PET weighs 54 g, one-eighth of the weight. This makes transport more efficient. Robustness. PET bottles don’t break, which makes them safer and easier to transport. Size. PET bottles are considerably smaller, so you get more of them in the same storage space during transport. Recyclable. Sainsbury claim that 92% of local councils have facilities for recycling PET. But question marks remain about the ‘real world’ recyclability of plastics. The main driving force behind the adoption of PET is an environmental one, and it has to do with the weight of the bottles, which reduces their carbon footprint through savings in the transport chain. The UK consumes around 1 billion bottles of wine each year, and estimates are that reducing the bottles for all these to the lightest available would save around 90 000 tons of CO2. If this is coupled to bottling in the UK, with bulk shipment of the wine, then the savings are magnified because around twice the volume of wine can be shipped in bulk per container. More on this later. One thorny issue that needs addressing here is one of health. There is some discussion of whether alcoholic beverages stored in PET leach phthalates out of the plastic. However, the phthalates discussed in connection with health, which are used as plasticizers and additives to certain plastics and which can act as endocrine disruptors (they mess hormone signalling up), are not the same chemical form as the ‘phthalate’ in PET (see here) for an explanation. PET, it seems, is pretty much safe. Finally, image needs to be considered. These bottles have a bit of a low-rent image, and I can't see consumers switching to them for expensive wines. It will also be hard convincing consumers that plastic is the environmentally sound option. If I was a wine producer I wouldn't use PET for my existing brands, but develop new brands where the alternative packaging is part of the story. Will PET replace glass? It's too soon to say. The trade is watching intently to see how the first few products in this new packaging fare.